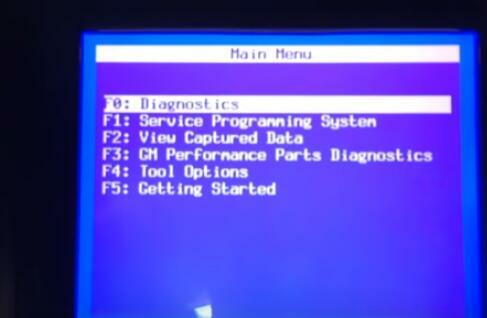 GM Tech 2 is a diagnostic tool for the most part. It can be used to program out/in certain RPO’s in the BCM and can be used to bleed the ABS brake system without introducing air into the system. The extent to which it can be used to tune a C5 corvette is that if you have a PCM Image that will work for your car you can save the current PCM Image and flash the new one you have onto the PCM. It cannot go in and individually change the tuning tables in the PCM as can say either EFI Live or HP Tuners tuning tools. But then those tools cannot touch the BCM either. If you do or plan to do a lot of diagnostic work on your car it can be a worthwhile tool. Most of the diagnostic charts in the factory service manual assume the availability of a Tech 2. 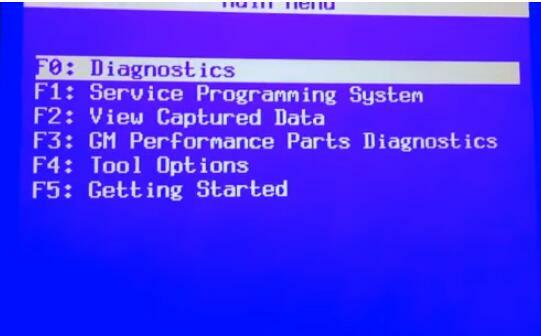 But you have to learn to use the tool like any other computerized diagnostic tool. It has layers and layers of menues to wade through. But in certain diagnostic situations it can be an invaluable tool because it allows you to turn on and off hundreds of computerized settings to aid in the diagnosis process. GM intentionally dumbed down the capabilities of the Tech 2 to change things to avoid law suits due to an errant technician that changed engine or emissions settings that could result in engine damage or emissions violations. Good to know: There are many factories working for Tech 2 production, including the genuine from the dealership and the clone by Chinese. If you are just looking for a decent Tech 2 for use, a working china clone can be a good option. But you should make sure of the quality! 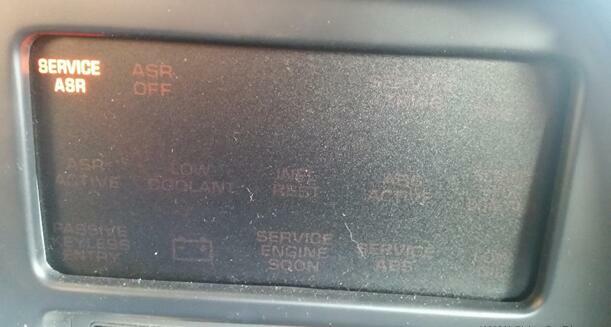 what is in the menu for a 1991 Corvette systems and a 2002 Pontiac Grand Prix SE 3.1L for the same. There are the 2 cars I own. Also what software version as I have seen 33.004 and 33.007 for GM english language. I am assuming I only need the dongle for the PC software if I want to reflash the ECU rather than just maintain the 2 cars. One of the things I don’t see mentioned even in the Bosch manual is the relearn crank sensor on the Pontiac or much about the 91 that the software claims to cover but no mention of bi-directional on the 91 Corvette. OK, I will have to spend some time to write down all of the menu items just for the 2002 Pontiac Grand Prix. 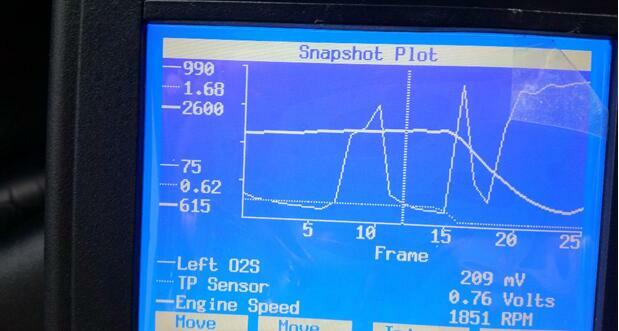 I did capture a screen for that car for what the GM Tech2 calls a Crank Position Variation Relearn. Relearn for 2002 Pontiac Gran Prix. The only vehicles listed under 91 is Saturn, however I have 33.004, so not sure if there is a 33.007 and it covers 91 better. If I enter 92 I have the option of doing diagnostics on a Y body with L98, which is certainly not for a 92. Perhaps for the 91 Corvette you need a different memory card, like this one. With the version of TIS2000 I have the versions supported are 27.010 and 27.012. I have no way see what is on those versions without downgrading my memory card, but would have no way to go back to 33.004. Computer representation of Tech 2 Screen. You can control Tech 2 with computer keyboard. If you forget to put security key in PC. Not actually connected to car. Do not load as version will be downgraded from the English GM 33.004 I am running. Selected parameters for 6 line graph. Tech 2 limited to 3 parameters for graphing. Tech 2 graph from www.obd2tool.com. Service ASR on during snapshot capture, went out next time car started. 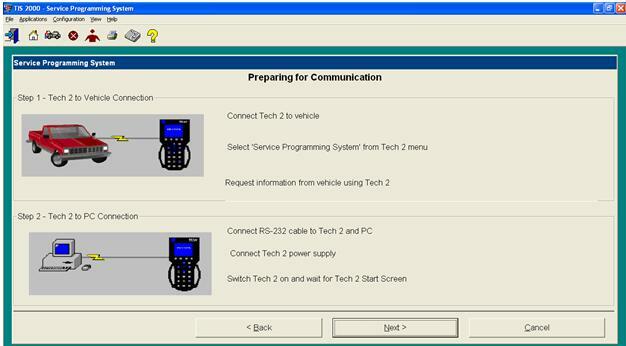 Here is the step-by-step instruction on programming GM (General Motors) ECUs with Tech2 scanner and SPS (Service Programming System) application in TIS2000. 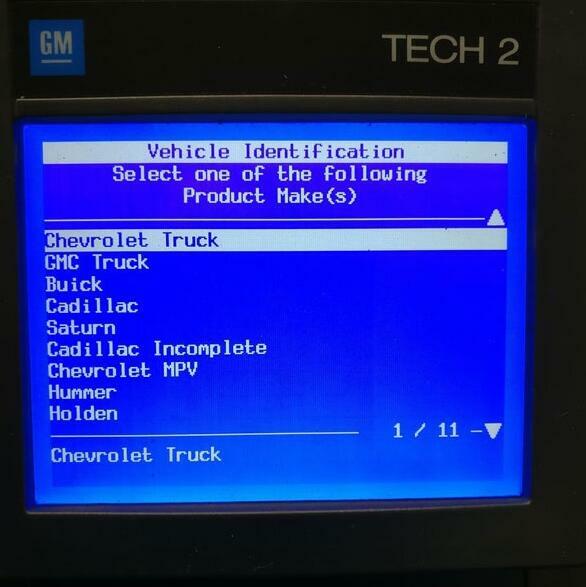 This article is an overview on how to use the GM Tech 2 Scan Tool to perform GM SPS Programming of calibration file updates for the ECU or any programmable module firmware on the vehicle such as the EBCM, TCM, or Radio that you may want to reflash. 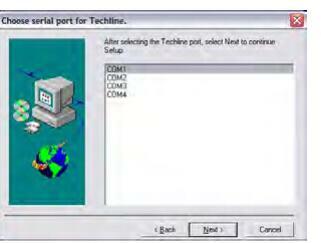 Of the different reflash programming approaches, this first video covers Remote Mode between the Tech2 and the Techline terminal PC running TIS 2000. This procedure applies equally to the genuine Tech2 manufactured by Vetronix, HP, or Bosch as it does to any clone or knock-off model from China. Warning: Pay very close attention to the instructions around power cabling and battery readiness as a power fluctuation during an SPS programming procedure can permanently damage a controller module. 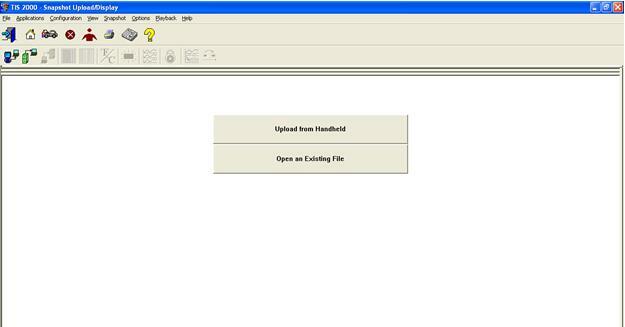 TIS2000 was deprecated by GM in early 2008, but was once the primary Techline Information System approach delivered to dealers via DVD media on a quarterly basis. Today we would use the subscription based TIS2Web as part of the ACDelco TDS server based offering to accomplish many of the same tasks, although Tech2 Remote Mode is no longer supported or offerred by TDS for newer vehicles. Note: be sure your USB to serial adapter device driver is configured for 115200 speed on Windows using Device Manager and that you set the COM port it is assigned to within TIS2000 for communication to be successful between the PC and the Tech2. Applicable to OBD2 model years 1996 thru early 2008 only, and for all makes under General Motors such as Chevrolet, Buick, GMC, Cadillac, Oldsmobile, Pontiac, Hummer, Saturn, Opel, Vauxhall, and Saab. The Tech 2 Scan Tool has been around since the 1980’s. It has been the flagship diagnostic tool and programing device for many many years. it continues to be a valuable part of the GM dealership stable because its quick, efficient, and works great! Now that other diagnostic programs that are, for the most part, only economically viable for GM dealership technicians to use (like Tech2WIN) the cost of Tech 2 has come down a little bit over years past. It is because the Tech 2 has been around for as long as it has that it is such a copied and cloned unit. Couple this to the advent of obd2tool, allowing rip-off artists world wide to sell cloned duplicates, the glut of good people who want to work on their own cars and want a dealership level tool, and technicians who want to upgrade beyond a piece of crap generic scan tool for GM family cars, and what you are left with is a global marketplace where 95% of the stuff being sold here is a clone, or simply someone else’s headache! All Tech 2’s are not considered equal. Tech 2 gives you unprecedented access to EVERY GM module and controller, provides the best and highest volume of vehicle data, and possesses the most bi-directional functionality of any diagnostic tool for GM family cars. There have been, however, a multitude of manufactures of Tech 2 over the almost 30 years it has been in production. Very early Vetronix units had solder joint problems which caused random communication failures. In addition to being an inconvenience, if this occurs during a programing event, you will be left with a garbage controller! Later models are made by Bosch, who bought Vetronix. They have cheapened the unit up so much that it is marginally better than a Korean clone. As a matter of fact, most of the electronics are made in Asia or in Eastern Europe where most of the clones come from. This was done as a cost cutting measure. The result is a slew of premature failures! The units that reside in the “middle” time were made and marketed by others like Hewlett Packard and OTC. These were the most reliable and durable units around. 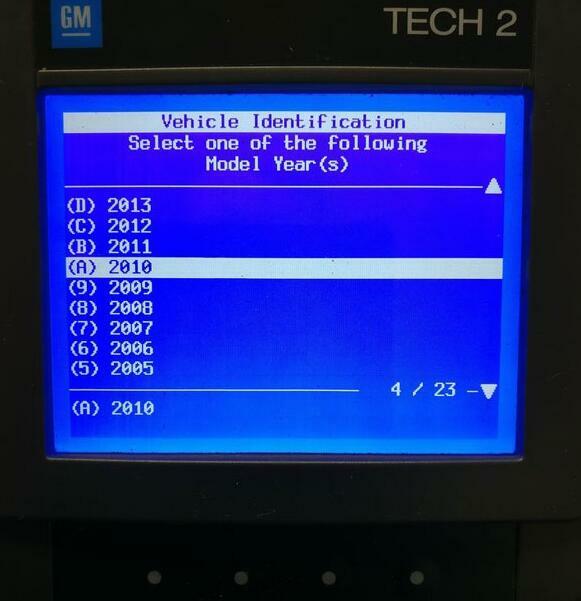 Tech 2 is not only a diagnostic tool, it is also is capable of programing new and used programmable GM controllers, configuring functionality within modules and updating GM family cars with the most current programing. You can gain access to programing on GM TIS on WEB website. With very little effort, and cables that accommodate your type of PC, you can update or install programing in any GM family OBD II or CAN compatible vehicle. Tech 2 can also be used on SAAB, Holden, Isuzu, even some Toyota vehicles with optional programing available through GM and accessible by anyone for weekly, monthly, or yearly subscription. A new Tech 2 unit retails for well over $4000.00. Anyone who tries to sell you a new unit for less is selling you a clone that DOES NOT work on every GM car, IS NOT of any quality and has a high failure rate. Clone Tech 2’s frequently destroy vehicle control modules, and are a complete and total waste of money! A lot of people buy a Chinese or Korean clone, and have no idea they have a clone! If they sell it to you, they didn’t know it was a Chinese or Korean clone. This is a highly cloned tool and even the original manufacturer(s) built some low quality units. Make sure of what your buying BEFORE YOU SPEND YOUR HARD EARNED MONEY ON IT. Clone scan tools are very easy to spot if you know exactly what your looking for! On Tech 2, there are tell-tale signs of a tool being a clone. Clone units DO NOT print on the unit that it is a clone. Clone units DO NOT say “made in china” or “made in Korea” or “made in Poland” on them, They say “Made in the United States.” The idea is that THEY ARE CLONES and thus are lying to make you think your getting an authentic unit, when instead, your getting a huge piece of crap that is, literally, worth pennies! There are hundreds of these clones out here on obd2tool being sold by people all over the world. There are private individuals who buy clones, either discover they have a clone and re-sell it as authentic, or have no idea its a clone and think its authentic. They have no idea because they bought it, think they couldn’t figure out how to use it (when in reality, it didn’t work) and just re-sell it as authentic. Either way, intentionally or nu-intentionality, you get stuck with it, and you may or may not know it until it burns out or destroys your cars computer costing you hundreds or thousands of dollars and untold hours and days of misery, just to save a few bucks! To use a Tech 2 scan tool in this day and age, 90% of all software packages GM offers require a minimum 32 MB memory card. A 10 MB card, although very useful for backup, data logging and flash programing, is useless for diagnostic programing for North American Operations (NAO), Saab, Isuzu, Suzuki and pretty much any of the other available software packages Tech 2 offers. If you think that, just because your using a Tech 2 for your personal use, you can buy a cheaper import unit, think again! I see HUNDREDS of these units thrown on the scrap heap every year. They cannot be repaired and are non-serviceable. Not all of these units will accept GM programing, thus cannot be updated. They are of grossly inferior quality and have an extraordinary failure rate, and damage more cars than I can express to you. If the Professional Diagnostic Tool Tech 2 your looking at has no production date on the inside cover for the software card on the top of the scan tool, its a clone. If there is no date, your looking at a clone! If the “VOID” warranty sticker is opaque in appearance and difficult to read, its a clone. If the Tech 2 has little white stickers over the case half’s on each side with the word “VETRONIX” and Chinese symbols denoting a date, its a clone. Most clones are being sold from Asian or European countries. Why would anyone be selling an item that was built here, shipped over there, and than put up for sale over there, to ship back here? Finally, there are PLENTY of people here in the United States selling clones! They buy a few hundred of them, and un-load them on unsuspecting people calling them “slightly used” or surplus. If they have very little feedback, or the feedback looks like it was written by a a foreigner, your likely looking at a clone. 90% of the units on obd2tool are being sold by people who are intentionally selling you garbage, import clone units. They don’t print that they ARE clones, but they don’t print that they are NOT clones! As long as their are ignorant people who are led only by the concept of saving a few pennies, there will always be clone items out here looking for an idiot to mate up with. Of the other 10%, half of them are selling you a clone are have no idea they are selling you a clone because they have no idea what they have or they are un-loading an early or late domestically built model that they are trying to get off of because it has damaged their car or doesn’t work right most of the time. Of that last 5% half of them are intentionally trying to rip you off! You do the math! Of one hundred Tech 2’s posted on obd2tool, both new and used, maybe 3 to 5 are the genuine article and are high in quality. If your going to buy something for thousands of dollars, buy it from someone who has the answers, knows the product and has priced it properly. Please use my experience to educate yourself on what your buying before you go shopping for it, and form your own opinions. Take advantage of this information to get what you want and get it for a good price. No matter what you decide to do, thank you for looking in and I hope this information helps you get what you want. 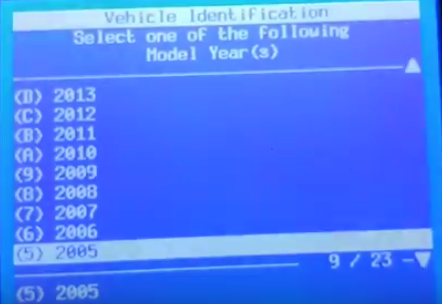 Tech 2 Scan Tool on Hummer H2 above 2007… Possible to do programming? what to do in that case? 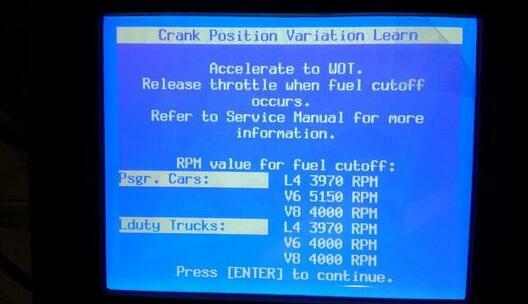 Actually it does the programming just fine on newer than 2007 GM vehicles! Pay for an ACDelco TDS subscription for vehicles above 2007 and you would use the CANDI module that comes with many of the Tech2’s for working with CAN bus vehicles. You can subscribe for as little as two days for $55. This is ONLY needed if you want to program or update the software in a module. ALL of the build in diagnostics and testing for vehicles up to 2013 works without the subscription or the older OBD-II scan tool TIS2000 software. You only need those for doing actual programming. The older TIS2000 software – that is what has the programming was discontinued in 2007. 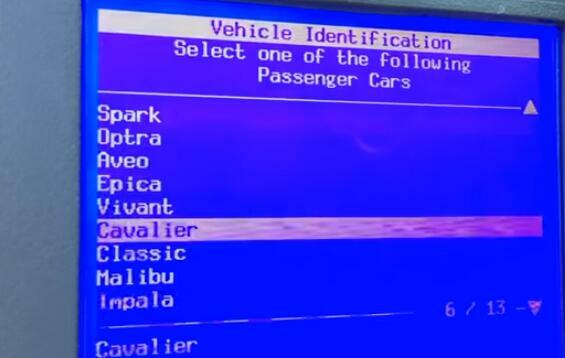 TIS2000 does have the actual programming for all vehicles up to 2007. After 2007 GM went to the TDS system. Get a newer style GM MDI or MDI 2 for diagnostics and programming. The catch with those. They have NO screen or built in software and you must pay for a subscription from from ACDelco TDS to use an MDI. Other brand units, a very select few can do actual programming and use the pass-through method. NONE have the diagnostics that the actual Tech2 or MDI (with the subscription) will have. Check with Autel and see if they have the full diagnostics and re-calibration for the rear air suspension on a Hummer H2. Not going to happen, there is too little demand for them to hack and reverse engineer that particular bit of code in a Tech2 to figure out the diagnostics and then write programming for that for their tool. 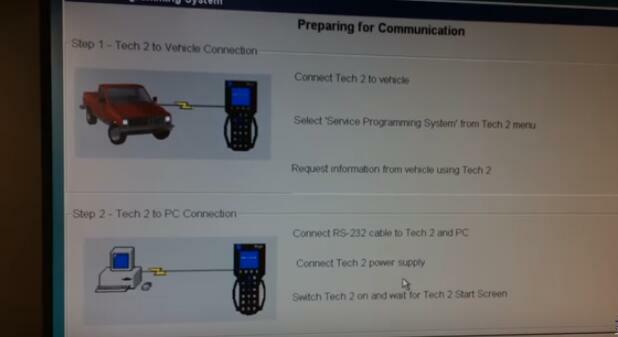 The computer will need a serial port for downloading the programming to the Tech2 for programming your vehicle. 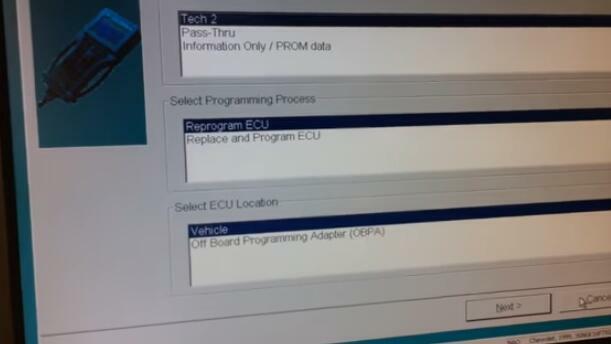 The way programming works is you connect the Tech2 to the vehicle and tell it you want to program a module. It interrogates all of the modules on the vehicle for the current versions and the VIN number. 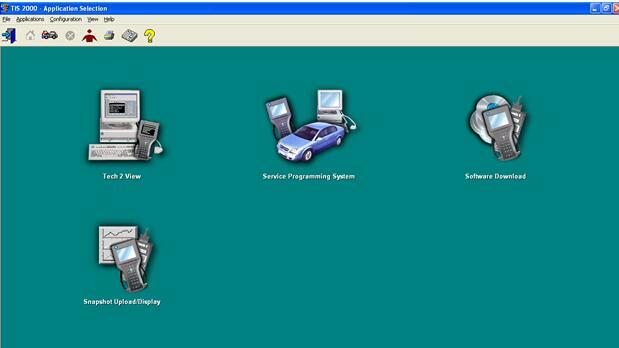 You then connect it to the computer running TIS2000, GlobalTIS or TIS2WEB subscription and select programming in the computer. 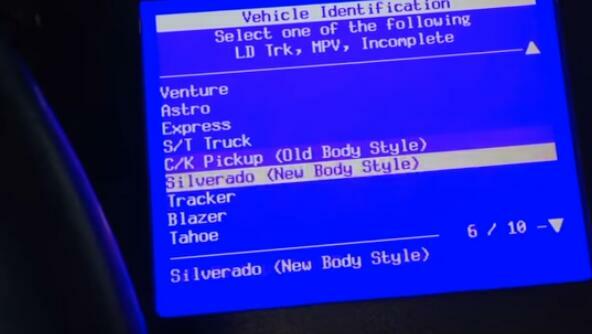 It reads the Tech2 for the vehicle info and then presents you with a list of software for all of the modules and shows you which have updated software. You’d better only do one module at a time which is a good bit more back and forth but safer. The computer then loads the update to the Tech2. You take that back to the vehicle and connect it and it then programs the module. To use a long enough serial cable (its uses 9 pin serial adapters with an ethernet cable to make the cable longer – so you can just use a longer network cable) and do pass-through programming. In that method the process is the same but you leave the Tech2 connected to both the computer and the vehicle at the same time. Once you select programming on the Tech2 then go to the computer and you can immediately update each module right from the computer. There is a slightly more updated version of standalone TIS2000 floating around on the web which has additional updates that has software updates for vehicles through 2009 as well. I know just using that TIS2000 both GMC truck and 2003 H2 both had a bunch of software updates available to be programmed all of which fix small issues or improve certain aspects. One example in on the older single compressor air ride like 2003. Those would run and make small adjustments a LOT more often than needed and the software update fixed that. On the H2 the rear air ride is also one to be very careful of for doing software updates though. For example, 2003 came with the earlier style single compressor but if it were to fail a dealership would replace it with the newer style dual pump compressor. Programming would still think its the original style and would attempt to program it and that would actually cause it to fail. TIS2000, (Global, Web, etc) will warn you about this sort of thing though so just heed all warnings and follow instructions and its fine. The programming aspect is not needed or required to use the Tech2. 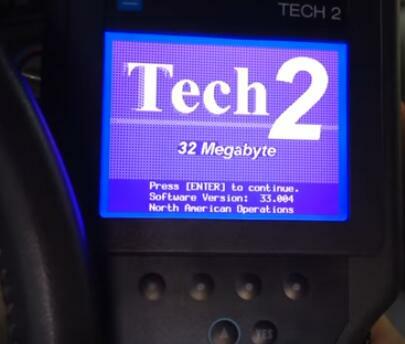 The Professional Diagnostic Tool Tech2 still gives you a TON of diagnostics and tests that NO other OBD device has including things like the air ride module, detailed BCM functions, basically you can control and test every computer module in the vehicle. I was looking for an example like Testing GM HVAC with GM Tech2. I have an 08 CTS that has the intermittent ticking mode door actuator. After an accidental battery drain, the passenger side stopped blowing cold air although for the past few months I noticed at times it lagged behind the driver side, temp wise. The driver side had always been fine until after the battery drain. It normally starts out fine with vent temps as low as 37 deg but has begun to fade mainly when the car is started up after cabin temps are already high where it hovers around 70 deg. I plugged in the Tech 2 which I’m still fairly new to and checked the blend doors cautiously as I didn’t want to create more trouble by initiating a test that I did not fully understand. There were no stored codes and the mode door and recirculation door appeared to have functioned normally as the values and air sound in the vents changed when they were commanded. The blend door motors however, both stayed fixed at 51 counts which I believe corresponds to the lowest temp setting of 60 deg they were set at. When I increased the console temp it also increased on the Tech 2 display but the counts did not change and the vent temps seemed to maintain the same bias with the passenger side blowing hot. The counts did not change when the temps were raised for each actuator using the Auto Scan Tool Tech 2 either. I did not perform the “On/Off” button test that you did here because I was not sure what it would do at the time, but intend to give that a try. I have also read that there is a calibration procedure that can be performed that I need to investigate further. I believe my situation is a combination of both calibration and actuator deterioration being brought to the surface by the recent battery drain. , this is good information that is hard to come by in such a straightforward presentation.? I recommend that you buy gm tech2 on OBD2 website. They are cheap, logistics is fast, and after-sales service is also very good. I have been using it for a year and there is no problem with the quality of the product. 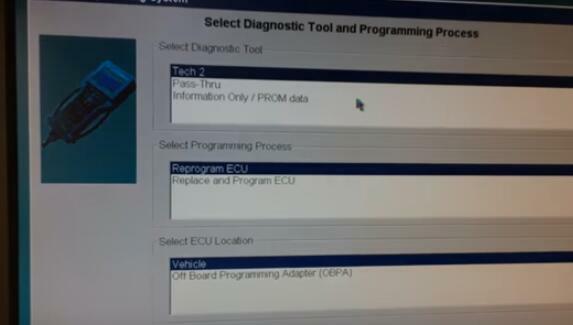 This is about GM Tech 2 scan tool for Hummer troubleshooting and programming. Can I have a cheap Tech 2 for Hummer? Yep. Both the original and HQ clone can work for your car. Where can I get a working clone at a good price? Why my Hummer is not shown in the GM vehicle list? That little short list is incorrect and only shows a few of the earlier than 2007 CAN bus vehicles. Tech 2 clone for both troubleshooting and programming Hummer? But I think it should be able to program Hummer. 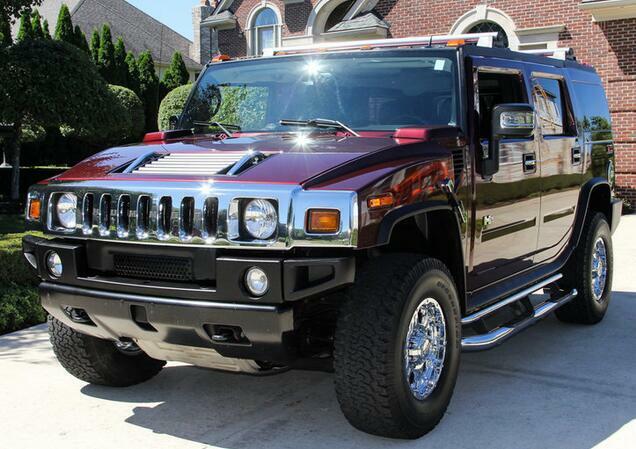 Anyone has good success of Hummer H3? My H3 has had a CEL on – po452. I checked it with the tech 2. Well it pulls 3 codes, po455 (large evap leak), po442 (small evap leak), and po449 (vent solenoid control). Tech 2 is possible to program for Hummer H2 above the year 2007… what to do in that case? Actually it does the programming just fine on newer than 2007 GM vehicles BUT you must pay for an ACDelco TDS subscription for vehicles above 2007 and you would use the CANDI module that comes with many of the Tech2’s for working with CAN bus vehicles. You can subscribe for it. This is ONLY needed if you want to program or update the software in a module. 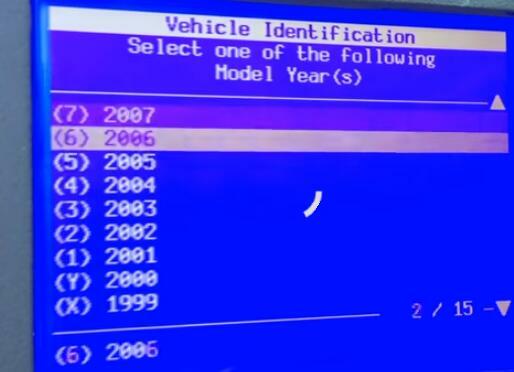 ALL of the build in diagnostics and testing for vehicles up to 2013 works without the subscription or the older TIS2000 software. You only need those for doing actual programming. 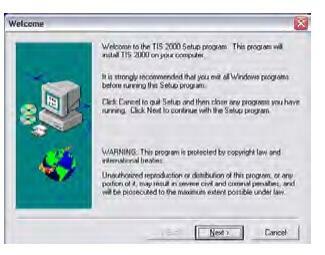 The older TIS2000 software – that is what has the programming was discontinued in 2007. 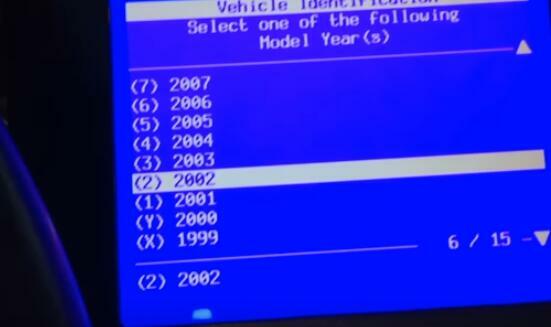 TIS2000 does have the actual programming for all vehicles up to 2007. After 2007 GM went to the TDS system. 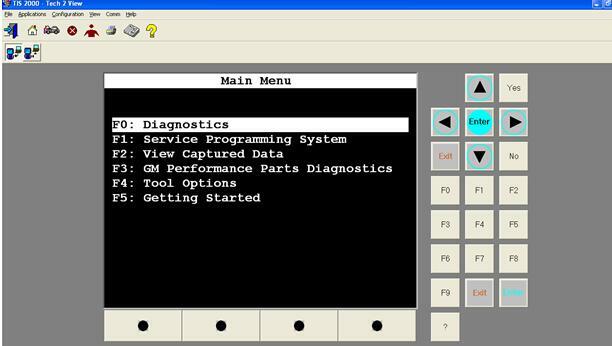 You can also get a newer style MDI or MDI 2 for diagnostics and programming. The catch with those. They have NO screen or built in software and you must pay for a subscription from from ACDelco TDS to use an MDI. Other brand units, a very select few can do actual programming and use the pass-through method. 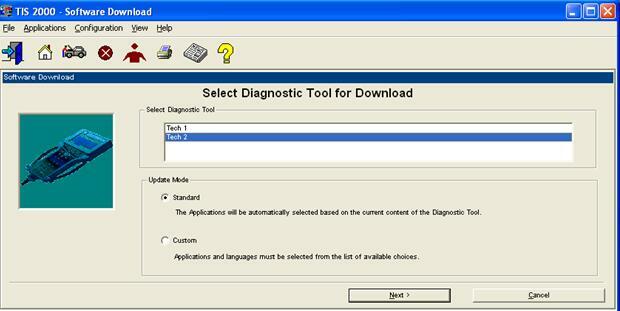 NONE have the diagnostics that the actual Tech2 scanner or GM MDI Scan Tool (with the subscription) will have. Check with Autel and see if they have the full diagnostics and re-calibration for the rear air suspension on a Hummer H2. Not going to happen, there is too little demand for them to hack and reverse engineer that particular bit of code in a Tech2 to figure out the diagnostics and then write programming for that for their tool. I just checked my Tech II clone against my 2006 C6. In the ABS section there is an “Automated Bleed” option. In the Radio section there is a “VIN Relearn” option. I’ve never actually used either one, but I bet they work. The clones are literally running the same software as the Tech II, so they have all the same functions. There are a few caveats: the standard clone power supply will cause the unit to reset if you run the starter motor, apparently, though this can be fixed. Also, operating while tethered to a PC involves a bunch of licensing hacks and other nonsense. But you only need to do that if you want to flash the ECU firmware. 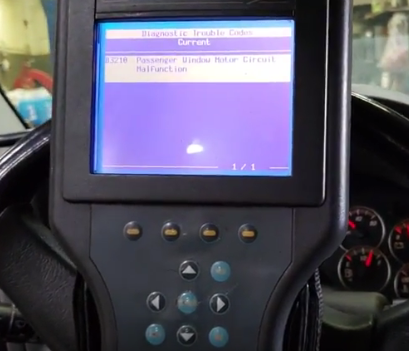 The OBD II Scanner Tech II lets you see (and individually reset) all the DTCs from all the modules. It also has a bunch of special functions and bidirectional capabilities. It’s great as a standalone diagnostics tool but it isn’t intended to modify ECU parameters like tuning software does. This is a tool for fixing the car, not modifying it. – If you have a network card installed then you only need to verify that TCP/IP protocol has been configured. 1 Insert the Application CD into the PC’s CD drive. 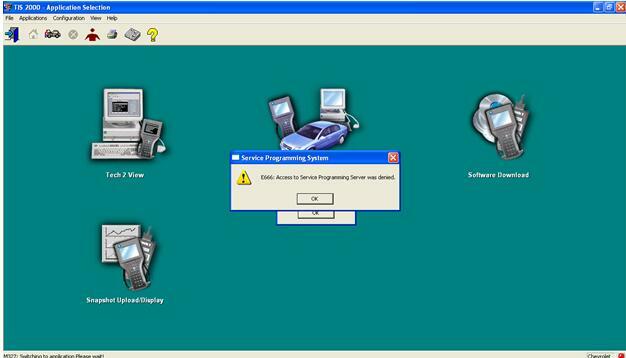 Note: If the Car Scanner TIS2000 software was previous installed and removed from the PC, a message may appear asking to reuse old settings. If so, click the NO button to NOT reuse old settings. 2 Click the Next button to continue. 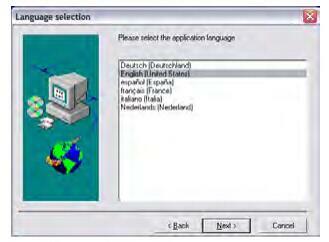 This displays the Language Selection window. 3 Select a language for the application and then click the Next button. This displays the Choose Destination Location window. Note: Clicking the Next button on the Destination Location window places the SPS application in the destination directory C:\Program Files\cosids. You can optionally click the Browse button to select a different destination directory for the files. 5 Select the serial port to use for the scan tool connection. This must be an open COM port where no external devices are connected. Then click the Next button. 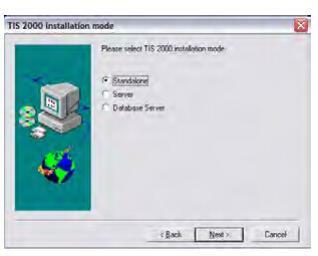 This displays the TIS2000 Installation Mode window. 6 Select Standalone and then click the Next button. This displays the Set DEALERSHIP window. 7 Select NAO (North American Operations) and then click the Next button. 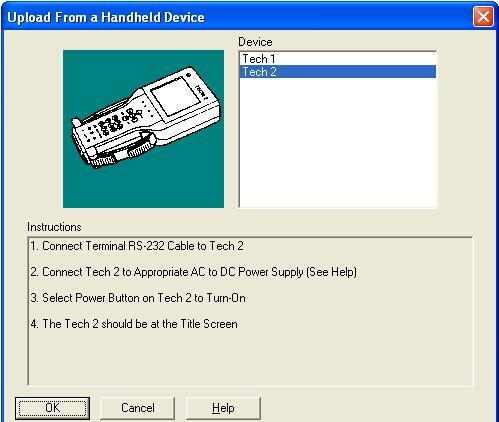 This configures settings, starts the Decurity Device Installation module, and displays the TIS2000 Security Device Add / Remove window. Note: This installation of TIS2000 supports reflash of Saturn vehicles. 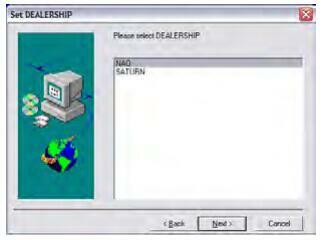 Other dealership installations are not supported. 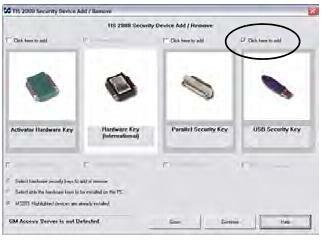 Note: The Security Device Installation module configures the USB security key, which is a component of the SPS Kit. The installation of the USB security key requires strict attention or TIS2000 will not perform as expected. 8 Click the checkbox above USB Security Key to place a checkmark in the box (Figure 1.14). Then click the Continue button. This displays an Information window (Figure 1.15). 9 Follow the instructions on the Information window and then click the OK button. This displays a Hardware Installation message box. 10 Click the Continue Anyway button. 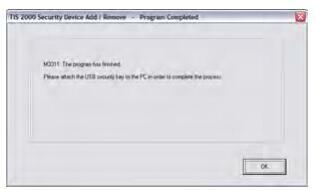 This displays the Program Completed window. 11 Install the purple USB security key as instructed on the window and then click the OK button. Note: Make sure the security key installs securely into the PC’s USB port. 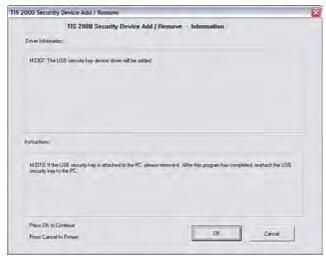 After installing the software, do not remove the security key from the USB port; it must remain in the port for the TIS2000 SPS application to work. 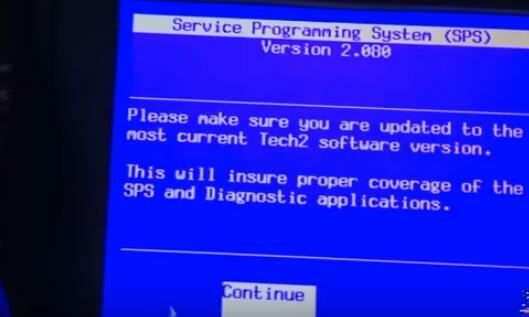 12 This begins the TIS2000 software installation and displays a progress indicator message. 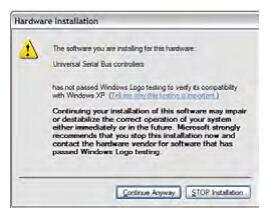 Wait for the installation to complete and for the completion message to appear (Figure 1.19). 13 Click the OK button. 14 Remove the Application CD from the PC’s CD drive. 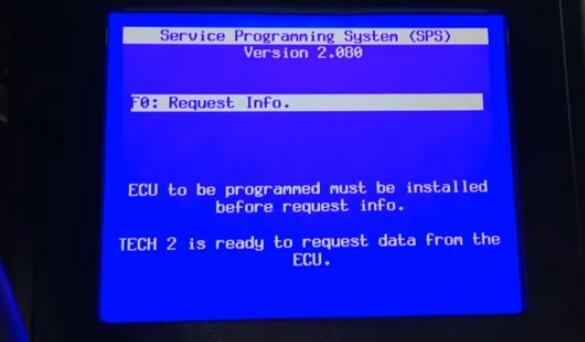 Note: During the update, the TIS2000 software skips the initial language, dealership, etc. steps and uses current TIS2000 settings. 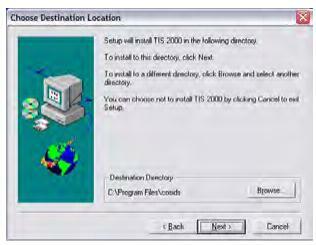 TIS2000 also skips over SecDevIns (Security Device Installer) and uses the current TIS2000 settings. 1 Insert the Data CD into the PC’s CD drive and wait approximately 20 seconds for the TIS2000 Update message to appear. 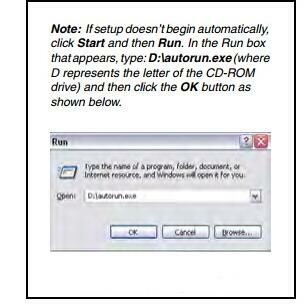 Note: On Windows XP systems, a browser window may open displaying the contents of the CD. If so, close the window and double-click the TIS2000 icon on the Window’s desktop. Because TIS2000 looks for new updates each time you start the application, the Update message appears. 3 Click the OK button. The application is ready to use. 4 Begin using the SPS application by double-clicking the TIS 2000 icon located on the Window’s desktop. 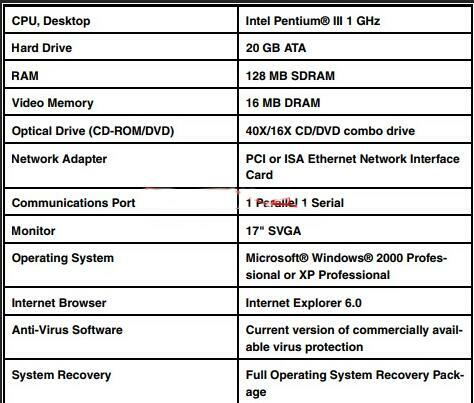 2 32 MB PCMCIA card recommended (May, 2005). Call OTC Technical Services at 800-533-6127 to determine the current minimum requirements. a Plug the RS-232 loop-back adapter (item 1) into the Tech 2 Flash RS-232 port. See Figure 2.1.
b Connect the DLC cable (item 2) to the Tech 2 Flash VCI connector. c Connect the DLC loop-back adapter (item 3) to the DLC cable. 3 Supply power to the Tech 2 Flash. 4 Perform the Power On Self Test (POST) as detailed in the Tech 2 Flash User’s Guide. 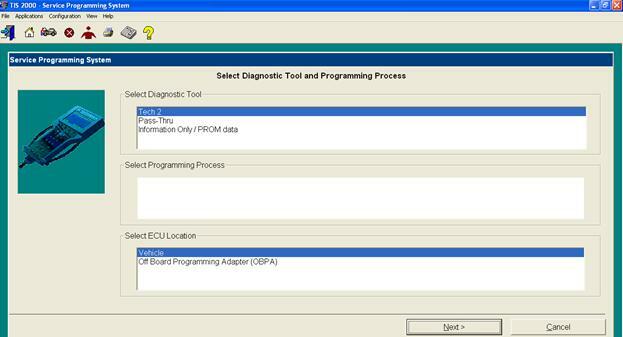 If any errors are detected, refer to the POST Troubleshooting Chart located in the Tech 2 Flash User’s Guide. If no errors are detected, go to the next step. 6.Disconnect the RS-232 loop-back adapter, the power supply, and the DLC loop-back adapter. 1 Connect the RS-232 DB9 serial port adapter (Item 1) to the open COM port on your PC that you selected when you installed the SPS application. 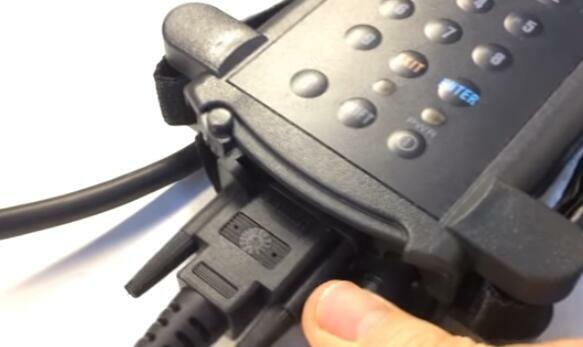 2 Connect the RS-232 communications cable (Item 2) to the DB9 serial port adapter (Item 1) and to the Tech 2 RS-232 port (Item 4). a Connect the NAO 12/19 pin adapter (Item 6) to the DLC cable (Item 5). b Connect a power supply (Item 7) to the DLC cable. c Connect the power supply to the appropriate power source (cigarette lighter, battery, or outlet). 5 Connect the DLC cable (Item 5) to the Tech 2 VCI cable connection (Item 3). could result:Battery voltage– The battery must be between 12.6 and 14 volts. The battery must be completely charged before programming. Important: Do not program while charging the battery. 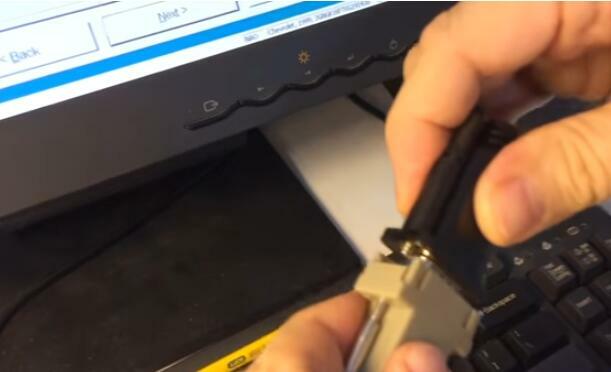 Connecting a second battery in parallel to the vehicle battery helps prevent drawing the battery charge low enough to cause a fatal error to the vehicle ECM while programming. 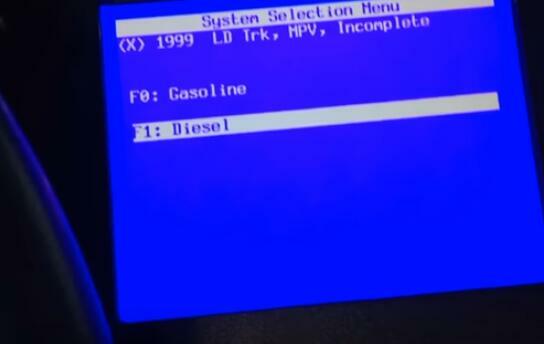 Ignition key on, engine not running – One of the PC message screens requests that the ignition key be turned on, engine not running. Important: Do not turn the key to any other position until the programming is complete.Once programming is complete, turn the ignition key off, wait about 30 seconds, and then disconnect the tools. This allows time for the vehicle computer to power down properly. Power interruption– Important: During programming,do not interrupt power or DLC connections in any way. This could cause permanent damage to the reprogrammable control module. Before programming, check all connectors and cords for wear, and check all connections to be sure they are secure. All cords must be properly routed and secure to prevent any entanglement with feet or hands. Tampering– A new control module is not preprogrammed.The memory of an in-use reprogrammable control module contains the vehicle identification number (VIN) as well as calibration data. 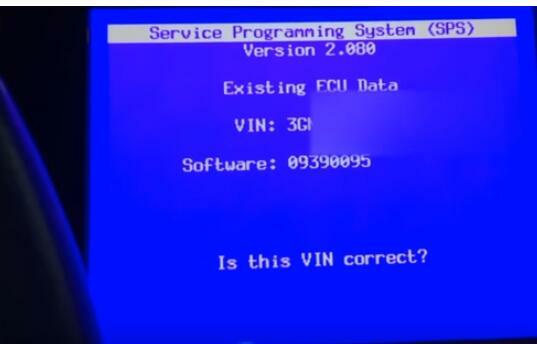 In the course of reprogramming an in-use control module, the VIN and the calibration date are replaced. 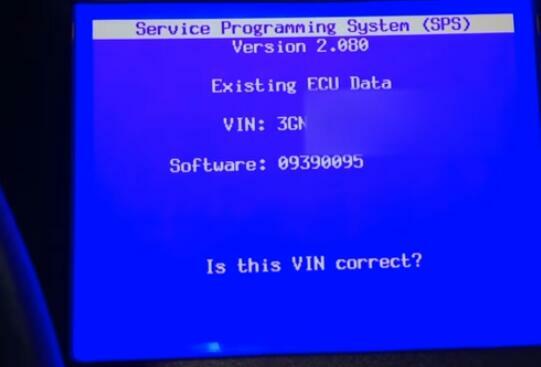 The VIN entered into the scan tool must match the VIN on the vehicle’s VIN plate. 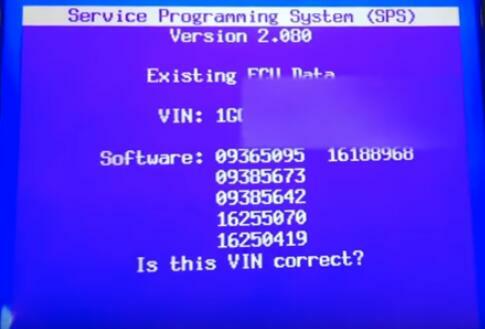 It is important that the correct VIN be installed in the control module for future service and in the event of a recall campaign that requires reprogramming the module. Other information entered into the program must also be correct. 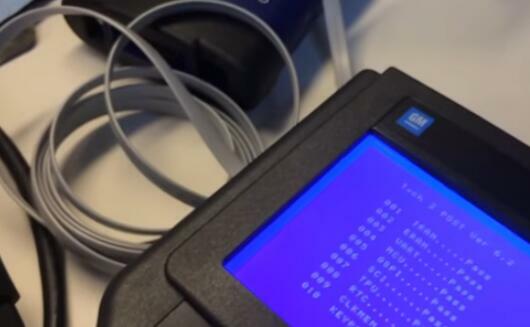 Programming improper calibration data could adversely affect vehicle exhaust emissions resulting in violation of emission control laws and regulations. 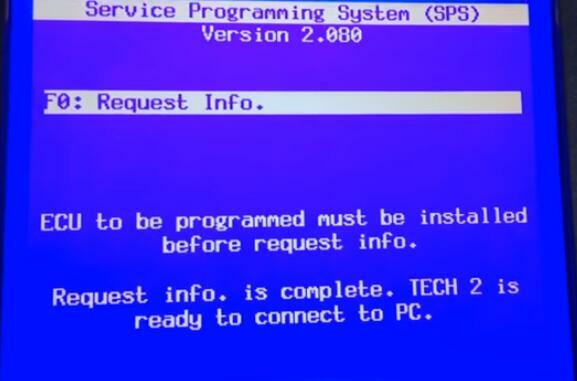 computer applications must be turned off before you use the SPS application. A screen saver, virus detection application,network connections, or any other applications that can activate without user prompting must also be turned off to prevent any disruption in communication. 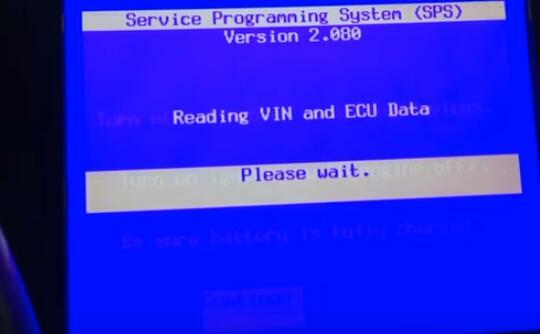 Any disruption during the reprogramming function can cause a programming failure and damage the vehicle computer. Current drain – Headlights and fans may be activated during the reprogramming steps. This can cause enough current drain to the battery to bring the battery voltage below an acceptable level for programming, or low enough to damage the vehicle computer. Set the parking brake to disable “automatic on” headlights. Remove the fuses for high current body electronic circuits, but do not remove the fuse for the vehicle computer circuit. Doors may lock– During programming, leave a window open to enable access into the vehicle.